My partner, Scott, is a photographer. Earlier this month we went on an artists’ retreat together. We rented a cabin in Colorado and spent part of each day making art. While I sat in the cabin typing away, he loaded up his gear and went in search of beauty. When we got home, I picked up some 4×5 large format color film he had had developed at perhaps the last remaining processor in town. He could barely contain himself, pulling out each sheet of film and holding it up to a window. As he looked at each image, he assessed the job he had done creating what he now saw, rattling off the details of the moment: natural light, time of day, exposure time, aperture setting. There was one shot Scott suspected he had overexposed slightly when he took it, so he had asked the processor to pull it from the developer early to correct the exposure. His artistic process is a mixture of science and guess work. One particularly beautiful shot of a beaver lodge on a fast running creek thrilled him. Thrilled. He jumped and danced and sang. I don’t mean to make him sound like a marionette. He did what we all do when we are experiencing joy. And I wondered, when is the last time I jumped and danced and sang over my art? Of course, I was thrilled to win the Confluence Prize and I will leap and shout when I land an agent, a book deal, see my work in stores. But that is not what I mean. Scott was looking at a piece of film, holding it up in front of a window. He still had to scan the positive (it’s not a negative), edit the image (if needed), make prints, and share it with the world. His creative process was far from over. His joy over seeing the image captured on film would be kin to my joy over reading a sentence captured on the page, a freshly written, unedited sentence, but one that artistically conveys exactly what I mean. When I read a beautiful sentence, I pause to savor it. I reread it. When I write a beautiful sentence, I feel some small accomplishment as I reread and savor it. But I don’t think I have ever jumped for joy. Is a well-crafted sentence less beautiful than an image? Does it induce less feeling? Perhaps the difference is that an image communicates with us on a more visceral level, while a sentence communicates on a more cerebral level. And yet, look what I wrote in an essay for one of my classes: “When I read Ethan Frome by Edith Wharton, I have the distinct sensation that the book has created an atmosphere. ‘A mournful peace hung on the fields, as though they felt the relaxing grasp of the cold and stretched themselves in their long winter sleep.’ Such sentences make me feel enveloped by a cold, gray New England winter’s light. It is this power of language to transport the reader through a sense of place or human entanglement to which I aspire.” Is that sentence by Wharton not visceral? Is it not beautiful? I was reading The Great Gatsby on the beach this morning. F. Scott Fitzgerald introduces us to Tom Buchanan, “Not even the effeminate swank of his riding clothes could hide the enormous power of that body—he seemed to fill those glistening boots until he strained the top lacing and you could see a great pack of muscle shifting when his shoulder moved under his thin coat. It was a body capable of enormous leverage—a cruel body.” What language! What an image! What characterization! I wonder if Fitzgerald did a little soft shoe next to his typewriter. Scott did not wait to see his image printed, framed, and hung in a gallery to celebrate. He celebrated the fact that he had captured the image he had hoped to capture and communicate. Whether we want to capture an image or a feeling or a moment in time, writers do the same thing, albeit in a different medium. I do not, however, know any writers who leap up from their desks to do a happy dance after laying down a particularly pleasing string of words. Maybe if we did, every session would feel productive and every day would contain a little more joy. I think the next time I write a beautiful sentence I will stand up and dance. I might even sing. This is one of my digital snapshots of the beaver lodge, not Scott’s art. 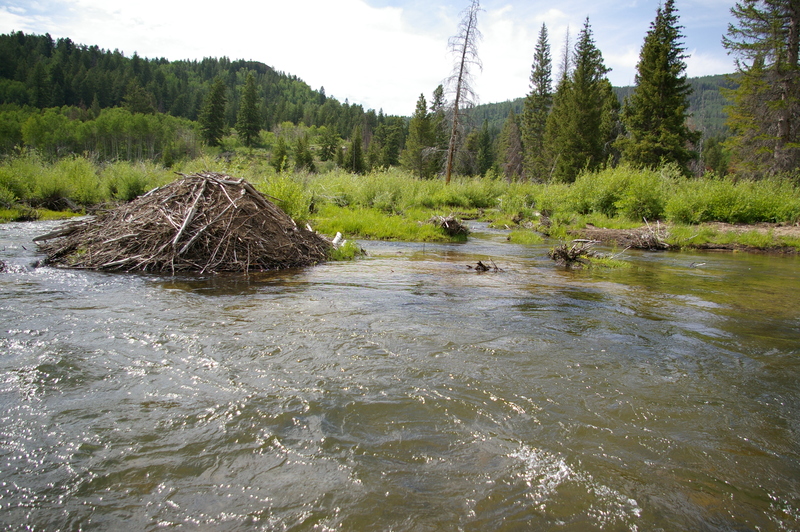 One of my shots of the beaver lodge. Great entry Alida! Love it. Let’s also consider that it is Scott… a man who jumps and dances around on pretty much a daily basis. 🙂 But I agree with your conclusion… it does us all a world of good to express and experience unadulterated joy!